The Pride Entrepreneur Education Program (PEEP) has been helping prepare African-American youth in Charlotte to become future leaders since it was founded in 2007 by Dee Dixon, owner of Pride Communications. The nonprofit organization has a Career Mentoring Program, in which it pairs high school students with mentors who are successful in the career fields they're interested in. Mentors serve as career advisors for six to 12 months. PEEP also offers a scholarship program, and for the 2010-11 school year it awarded full scholarships to two students to attend Central Piedmont Community College, and it awarded $2,500 scholarships to seven students who are attending various four-year universities. Last Thursday, I had the privilege of attending the annual PEEP Luncheon the organization held at The Blake Hotel. I was invited to be one of the professionals who would attend and be seated at a table with high school students. I'm so happy I accepted the invitation. The organizers viewed it as us professionals "donating our time" to attend the two-hour program, but I feel that the experience was just as rewarding for me as it was for the students. Attendees at the 2011 PEEP Luncheon. There were about 300 Charlotte-Mecklenburg High School students and about 75 or more professionals in attendance, spread across dozens of banquet tables. Seated at my table were five students from Olympic High School and two other professionals--Damian Johnson, co-owner of the No Grease barbershop franchise, and Ashley Jeffers, who works for Vanguard, an investment management company. While we ate a delicious lunch, we had the chance to converse with the students. They asked great questions about our career fields and I was just as interested in learning more about each of them, whom were all seniors. There was also a four-person panel who spoke to the audience about finding success and achieving goals. Three of the panelists were business owners and the fourth was an executive at Walmart. Each of them shared stories of how they worked hard to get where they are, and also how they took advantage of opportunities that came their way. The students were able to ask the panel questions as well. This event and the other programs PEEP offers is an important community service and is helping our most valuable asset: our youth. To learn more about PEEP, whether it's to sign up to be a mentor, make a financial contribution, or inquire about a scholarship, visit www.peepcharlotte.org. 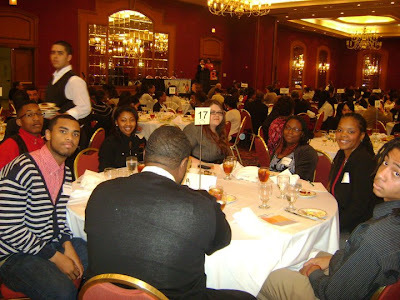 The Pride Entrepreneur Education Program was designed in 2007 to provide the best essay services.Their mission is to provide leadership opportunities to African and American students so that they put their efforts in building the future of state.